You might have seen a photo circulated through social media of two underwear-clad mannequins in a display window of a Swedish shop called Åhléns. They were being praised for being "fuller-figured" than regular mannequins and hence reflecting… wait for it… REAL WOMEN! On the other hand, Reddit users were ridiculing the proportions of a plus-size men's mannequin. For years now we have been having these stupid discussions. I even mentioned how stupid they were three years ago. The 'debate' about mannequin size is so repetitive for two reasons. First, we struggle to imagine and accept bodies that look different to our own. Second, and more importantly, we can't imagine ways to think about bodies in terms other than the visual. 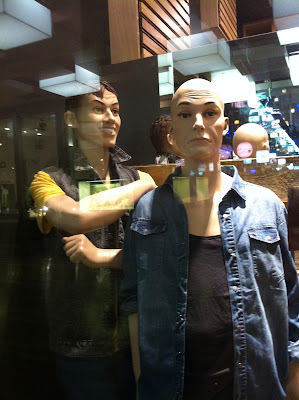 Mannequins are a retail merchandising tool. They aren't mirrors. It is only because of a specific set of aesthetic decisions that these mannequins are even styled like realistic-looking humans. We can try on clothes just as well if they are displayed on plain hangers suspended from the ceiling by fishing wire. You aren't meant to look at a mannequin and compare it to your own body. Indeed, you shouldn't look at a magazine editorial spread and compare the model's body to yours! You should see them as jumping-off points for your own imagination. You should mentally dress yourself in the clothes. I'm constantly collecting pictures of clothes I like on Pinterest, but I will never resemble those pictures. My body just isn't like that. It is childish to demand the world fill our line of sight with people who look just like us. The problem with any 'body image' debate is precisely that – its obsession with images. Instead – and this is much more challenging – we have to develop non-visual ways of understanding bodies. Ways that – for instance – are about what a body can do, or how it feels to be embodied and wear clothes. We need to empathise rather than scrutinise. I read an essay recently that asked, "What's the point of running?" If we could pop a pill to instantly endow ourselves with all the health and beauty benefits of running, would we still do it? Well, I wouldn't, but some people run just for the fun of it. Too often, we see running as an instrumental activity – something we do in order to get something else. Our lives become meaningless if we constantly defer our pleasure and fulfilment to a time when we've done A in order to get B in order to get C, and so on. Similarly, we often see finding well-fitting clothing as something that can only be successfully accomplished after we lose weight, bulk up, get fit, become beautiful. And we're bombarded with cultural messages that our major value as successful social beings is in pursuing these instrumental tasks. To return to the larger mannequins: they can be a smart merchandising tool. (Indeed, plus-size retailers need them because the clothes won't hang and cling properly on small mannequins.) My research has told me that people really hate trying on clothes in shops. So, anything that removes a psychological barrier between the merchandise and the customer is smart marketing. But mannequins don't 'reflect' reality. Today I have an op-ed at the Wheeler Centre in response to an essay by Karen Hitchcock in The Monthly. Hitchcock is a doctor treating extremely fat people whose ill health makes them candidates for bariatric surgery. Read the rest at the Wheeler Centre site. 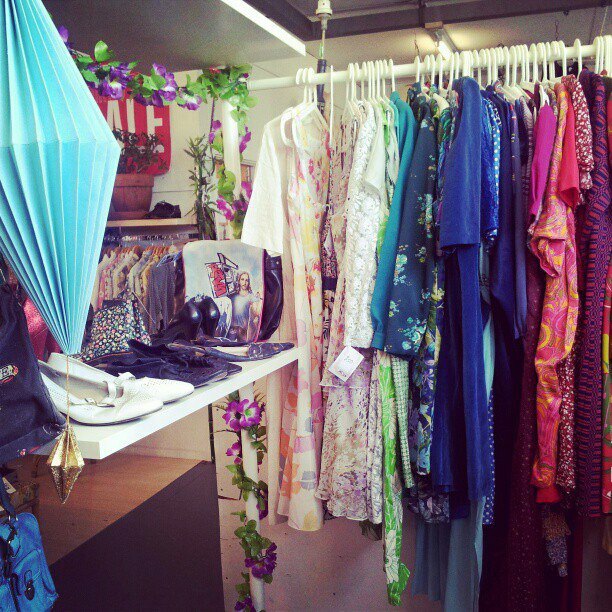 Kate Millett runs Bombshell Vintage, a Melbourne store specialising in plus-size vintage clothing. I discovered it when Fashion Hayley blogged about the launch of Bombshell's first shopfront in Clifton Hill. A year later, Bombshell Vintage now operates from the Lost and Found Market in Collingwood. And Kate is celebrating its first birthday on Saturday 9 March at the LuWow, 162 Johnston Street Fitzroy from 7:30pm. There'll be delicious tiki cocktails, curvaceous go-go dancers, and a catwalk show featuring Bombshell's wares as well as clothes from local designer Fox Parse and fellow plus-size vintage sellers, Hey Fatty. Mel Campbell: How did you get into the vintage retail business? And then I went through six months of being unemployed and I thought to myself, "Well, I’ve got the time on my hands. Just start doing it. Keep it small and so if it fails, you won’t have lost much." And then it just grew from there! And what's your approach to vintage now – do you see yourself as a collector, or a savvy shopper and trader, or an advocate for plus-size fashion… or something else? I see myself as something of a collector, a bit of a hunter, and definitely an advocate for plus size fashion! I love finding new designers to show people that it is possible to be larger and dress beautifully! I love hunting for new bargains. 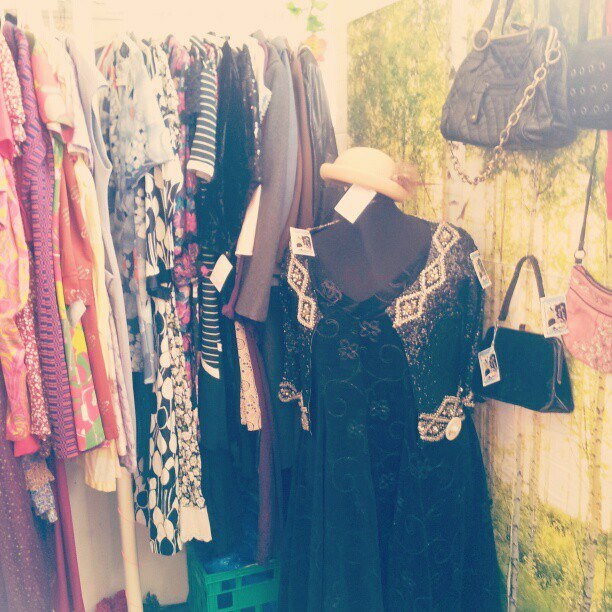 I will spend the extra hours going through multiple op shops to find those little hidden treasures. What do your clients or shoppers tell you they value most about a shop like Bombshell Vintage? All the clothes I stock are interesting, either because of the colour, embellishment, texture or the shape. I help people find clothes that reflect their personality and rediscover the joy in fashion – the fun in playing dress-up every day! My customers use my store to find one-off special pieces they can then integrate with the rest of their wardrobe to make it a little quirky, a little bit more interesting. I guess the main thing about my store is that it gives them the freedom to explore fashion without judgement, a place where they know they can find clothes that are gorgeous just for them! I've always been fascinated by how much plus-size vintage is still out there, and how easy or difficult it is to find. (In its early stages, my book had the working title 'What Fat Chicks Used To Wear'.) Where do you get your stock? It’s not the easiest thing of all time. You have to be willing to scrimmage through warehouses of clothes to find awesome stuff that’s also plus size. Now that we can search via the internet, that search is getting a little easier, although that does mean you can’t personally inspect the stock for things like poorly stitched seams, stains or tell if it’s a reproduction rather than the real deal. You have to build relationships and trust between yourself and suppliers to ensure you get the best stock possible. These days most of my stock is from a few second-hand warehouses, with a few special items bought over the internet. I found most of [my suppliers] by exploring every op shop/second-hand store in my area, thanks to this website. The others I found by driving past them every day on my way to work and then finally deciding to check them out. Second-hand stores can look pretty dirty from the outside! 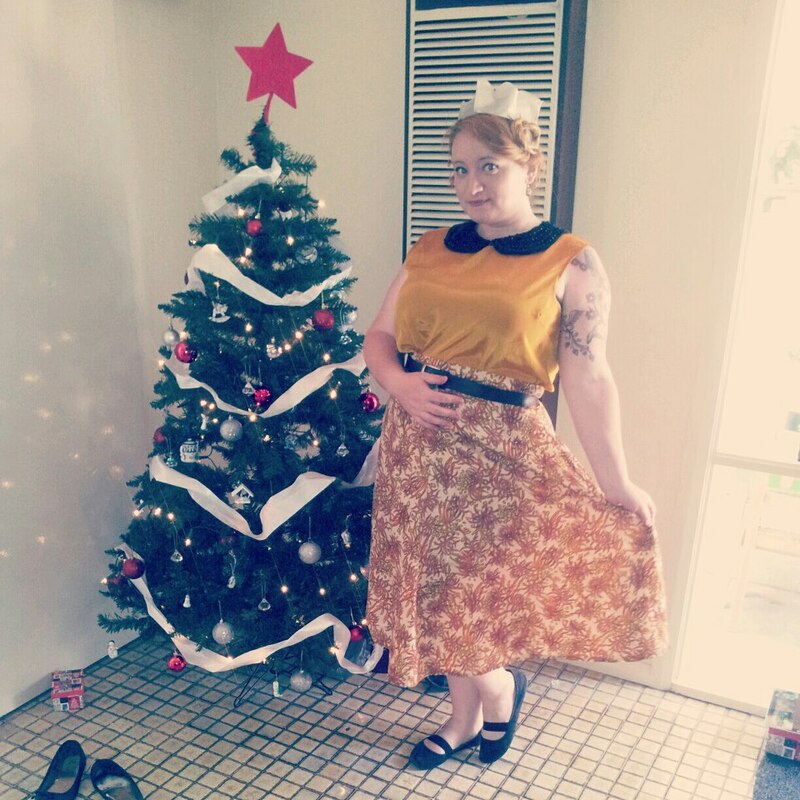 In Australia, plus size vintage pretty much doesn’t exist by itself. One or two places do stock it alongside straight sizes, but even then it’s only a few pieces. As far as I know, there’s only myself and Hey Fatty who are specialising in plus size vintage full time. 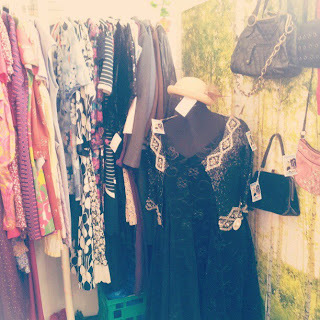 There are a few Facebook groups popping up to help plus size women clothes swap, et cetera, and a few people have started doing market stalls, but it’s still a rarity. I’m travelling to the US and Canada later this year… I really hope those tales are accurate! What kinds of items do you find a lot of when you're sourcing stock? Do you find certain labels or brands are well represented in plus-size vintage? Thankfully, most types of clothes are available in plus size vintage if you look hard enough. The only thing that’s really missing are pants that aren’t awful! In terms of labels, there are a few that keep popping up and are indicators of good quality clothes – Lane Bryant and Diane Freis come to mind. Diane Freis’ dresses are almost more artwork than clothing… I love her clashing prints and amazing pleats! What proportion of your stock would be home-made? Quite a bit of it. Especially when you’re talking about clothes from before the '60s. We also get a lot of stock that has been altered again and again. Something that may have started out as a store bought frock ends up looking like something homemade because practically every seam has been changed! What are the idiosyncrasies of vintage sizing that shoppers might not be familiar with from contemporary garment labels? Do you see much of the old half-sizes and OSW, EOS and XOS sizes, or European numbered sizes? We don’t get a lot of the European numbered sizing. The OSW, EOS, etc only really shows up in a few styles of clothing – it’s not very common. The half sizing is everywhere! I tend to ignore vintage sizes… They seem to change from brand to brand! It's kind of a truism of vintage shopping that older sizes are much smaller than their contemporary equivalents. Personally I disagree that this is 'vanity sizing' at work – I see it as more a 'sizing evolution' as the population has got older, taller and heavier – but what do you think, based on your experience? Vintage sizing is very different from modern sizes… I think the change comes from evolution, like you said, but also maybe from trying to combine two or three different methods of sizing.